Dr. Ronda’s example: My greatest fear is of being alone and abandoned. When I recognized this fear, I started praying “God alone is enough” over ad over again during my prayer time but also between things. 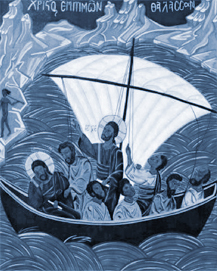 It happened that the Gospel reading was about Jesus calming the storm when the disciples thought they would all drown. The Pastor quoted a spiritual writer as thinking that instead of begging Jesus to save them, they could have expressed more trust by asking Jesus to give them His peace that enabled Him not to be afraid even in a storm. Do we try to drag Jesus into our turmoil to take it away, or shouldn’t we, instead, beg Him to give us the peace to withstand turmoil? the priest asked us. As a result of pondering this message and saying God alone is enough often, I felt much more peace. Prayer: Providential God, I bring to you now my worst fear. (Reader: put in the prayer your worst fear) Please quiet my soul as You calmed the storm for Jesus and the disciples. Let me not only experience surcease of anxiety, but deep peace.